High quality, in both production and materials, has always been a top priority when we are developing personalized beds and mattress solutions. 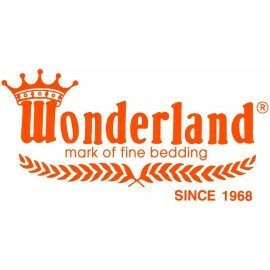 Invest in a Wonderland bed to get the sleep and rest your body needs for an active lifestyle. Bonnell Spring SystemLuxury quilting which provides superior comfortMattress fabric may vary without prior noticeMattress thickness 15cmFirmness rating 2/10 SoftFirmness is subjective due to difference in preferences and body weight..
Bonnell Spring SystemLuxury quilting which provides superior comfortMattress fabric may vary without prior noticeMattress thickness 19cmFirmness rating 3/10 SoftFirmness is subjective due to difference in preferences and body weight..
Bonnell Spring SystemDamask TickingTreated with Anti-Dust MiteMattress fabric may vary without prior notice.Mattress thickness 20cmFirmness rating 4/10 Medium softFirmness is subjective due to difference in preferences and body weigh..